I do this odd thing for the sheer joy of it. I collect be-prefix words. in my writing, to bestow on them the joy I’ve betaken. On an especially good day, I might make up a new be- word. Now, I am fond of other prefixes. I might start a new page in the back for en- words. What does the “be-” do? It means thoroughly, completely, to make. Two be-prefix words are so common, we almost don’t see them. Beloved. Greatly loved. More loved than loved. Become. More than come; to come to be. befriend, to cause to be friends. This entry was posted in Autobiographical, Musings, Words and tagged become, beloved, bemused, beseeching, words by alivingpencil. Bookmark the permalink. What fun, Carol! 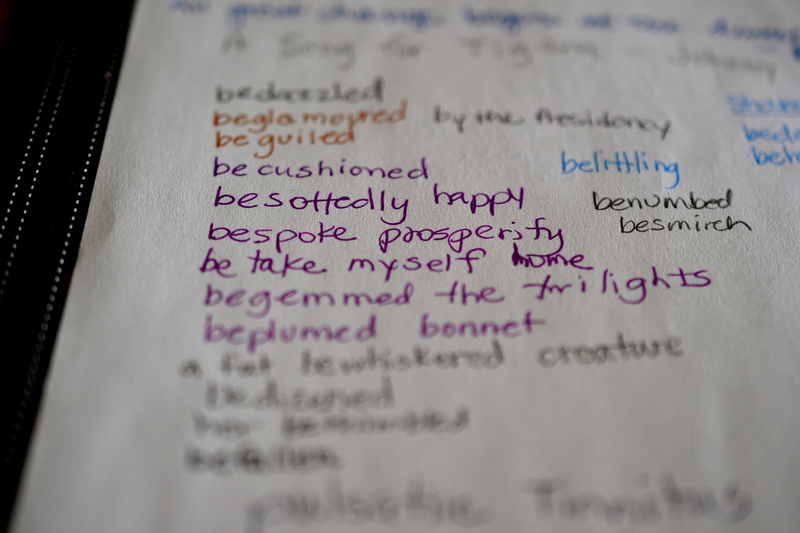 It’s interesting that you have a hankering only for the “be” words and I love that you write them in the front of your journal. I think I may leave a few pages open in the front of my new journal for interesting words that cross my path in 2015. Thanks, Tammy! A year from now, I’d love to hear what words you’ve copied. I am beside myself with this blog post! Words are wonderful! Lovely! I read in I Timothy yesterday that God richly provides us with everything for our enjoyment. Words would definitely fit that category. Thanks, Hope! These words give me great joy! I am so thankful that you write, because it is such fun to read what you are thinking. You are a beloved commenter, jep! Thanks for your steadfast encouragement. Oh, man! I’m thrilled! Bebe, what a fabulous name! I love “be” prefixed words, too. Fun read, Carol…..just like everything you write!